Tabloid Watch: Daily Star. Front page lies. Again. BUNGLING Prince William wrecked a £2million RAF plane after flicking the wrong switch in the cockpit. 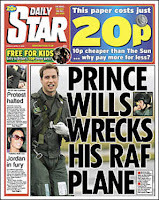 The heir-head blunder cost a fortune to fix and left Wills the laughing stock of his pilot mates. The 345mph RAF Tucano was grounded for more than a week as air force investigators pored over it to discover what had caused a 700 degree Centigrade temperature surge. But they found nothing wrong with the plane – and put it down to “pilot error”. A Buckingham Palace spokesman added: “We are aware of this incident. But we can confirm there was no damage done to any aircraft during Prince William’s training’’. So what the hell is this doing on the front page, presented in this totally misleading form? Is it just that no-one takes the Star seriously any more that it keeps getting away with splash after splash of completely untrue drivel?